Data security is the foundation of every transaction that touches CardConnect. In an effort to continue to offer a secure means of communication to our systems, CardConnect is upgrading its systems and applications to accept Transport Layer Security (TLS) 1.2. In an effort to provide additional time to our customers to ensure TLS 1.2 readiness, we have extended the timeline for accepting TLS 1.0 and TLS 1.1 communications until June 18th, 2018. After this date, we will no longer support communications made with the TLS 1.0 and TLS 1.1 protocols. Please ensure that you are prepared for this new cut-off date by referring to the How the Upgrade Impacts You section below. The Transport Layer Security (TLS) protocol encrypts and authenticates the data that is passed between communicating applications and their end users. For example, when you enter your login credentials on a website, TLS prevents a third-party from stealing the information that is exchanged during the login process. The PCI (Payment Card Industry) Security Standards Council, which defines security and safety rules for the payments industry, no longer considers TLS 1.0 and TLS 1.1 to be a secure form of encryption because it is vulnerable to various types of attacks. As a result, all service providers and merchants who process or transmit credit card data must take the necessary measures to ensure that their systems and applications are upgraded to accept the TLS 1.2 protocol. For additional information on TLS and and the risks that are present when using TLS versions 1.0 and 1.1, please refer to the PCI Security Standards Council’s Information Supplement on Migrating from SSL and Early TLS. How is TLS Used at CardConnect? We will be permanently deactivating support for TLS 1.0 and TLS 1.1 on March 15, 2018. Please ensure you have tested your systems for TLS 1.2 readiness prior to this date. If you are a CardPointe and/or CoPilot user, it is important to ensure that your web browsers are up-to-date. Most browsers have supported TLS 1.2 for some time, but if you haven't updated your browser to the latest version, then you may be impacted by this upgrade. Please refer to the Web Browser Support section of this page to verify whether your browser(s) is supported by TLS 1.2. If you run one of the following versions of Java, it is important that you take action before March 31st, 2018 to continue to communicate with CardConnect's services. Yes, but support for TLS 1.2 must be enabled. JDK/JRE 7 Server and above TLS 1.2 enabled by default. Your OpenSSL version must be 1.0.1 or higher. These security enhancements will require the deployment of a new CardConnect codebase in your Oracle EBS environment. CardConnect will contact you regarding the deployment of the new code as well as the added functionality included in this release. No updates are required for your SAP system. Validate SAPCryptolib via SAP Transaction: SSF02. Restart ICM for these new parameters to be active. Ensure current Java Cryptolib - OSS Note: 2284059. Please refer to the SAP PI blog for more information on upgrading to TLS 1.2. If you use an integrated Ingenico USB Device, please refer to the details below to determine the necessary actions that are required to ensure a seamless transition to TLS 1.2. Bolt terminals are not impacted by the upgrade to TLS 1.2. 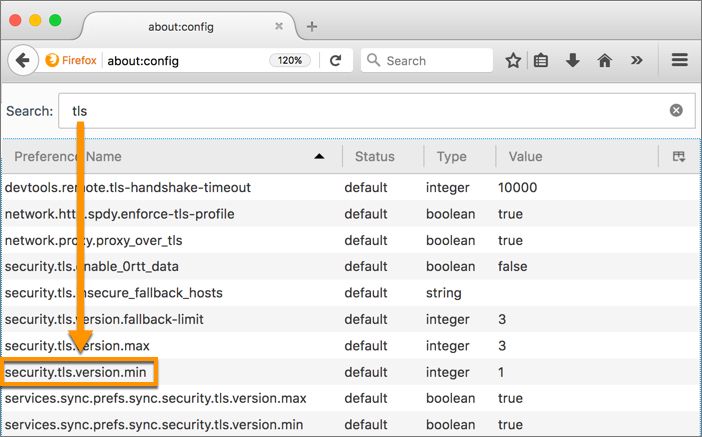 If you are a Bolt API user, please refer to the Bolt and API/Gateway section for additional information. The Web Tokenizer is not impacted by the upgrade to TLS 1.2. The iFrame Tokenizer is not impacted by the upgrade to TLS 1.2. Refer to the table below to determine if action is required on your part based on your version of the .NET framework. Update to the .NET 4.5 framework. Desktop Tokenizer and PANpadUP will notify you that an update to .NET 4.5 is required if .NET 4.0 is still in use. Update to the latest version of Desktop Tokenizer. If you're a PANpadUp user, you must update to the latest version of PANpadUp. ccs.exe The new version of the Desktop Tokenizer application. cs.ini The Desktop Tokenizer configuration file. ccpanpad.dll The new Dynamic Link Library. For details on testing the new application, refer to the section Testing a New Application. Note: The configuration settings within your existing cs.ini file should be ported over to the new cs.ini file that is included in the Desktop Tokenizer .zip file that you downloaded. ppu.exe <="" td="">The new version of the PanPadUp application. ppu.ini <="" td="">The PanPad application configuration file. Note: The configuration settings within your existing ppu.ini file should be ported over to the new ppu.ini file that is included in the PANpadUp .zip file that you downloaded. Download and install an update to the .NET 3.5.1 framework, which enables the framework to work with TLS 1.2. Download the new PANpad DLL and refer to the README.txt file that is included in the .zip for more information. Update to the .NET 4.5 framework. Upon updating to the new version of Desktop Tokenizer, PANpadUp, or DLL, we recommend a full regression test of the new applications in your environment in order to ensure compatibility of all implemented changes for TLS 1.2 support. This includes all required tokenization scenarios in UAT (User Acceptance Testing) and Production. Support of TLS 1.2 is strongly correlated to which .NET version is running within the Windows environment. Please coordinate with a network administrator to verify and confirm that the .NET version supports TLS 1.2. If running .NET 4.0, then an update to .NET 4.5 will be required. If testing is executed with either the Desktop Tokenizer or PanPadUp while running a .NET version that does not support TLS 1.2, then the CardConnect application will prompt the user with the appropriate action before any testing can proceed. Refer to the information below to determine if your web browser is supported by TLS 1.2. - Chrome OS Your web browser is not supported by TLS 1.2 and must be updated. v1 through v4.0.4 Android Your web browser is not supported by TLS 1.2 and must be updated. v4.1 through v4.4.4 Android You must enable support for TLS 1.2 in your browser. v5 through v8 Android Your browser supports TLS 1.2. - iOS 9.0 and up Your web browser is not supported by TLS 1.2 and must be updated. - iOS 9.0 and up You must enable support for TLS 1.2 in your browser. - iOS 9.0 and up Your browser supports TLS 1.2. - Linux Your web browser is not supported by TLS 1.2 and must be updated. - Linux You must enable support for TLS 1.2 in your browser. - Linux Your browser supports TLS 1.2. In the Search field, enter tls. Locate and double-click the entry for security.tls.version.min. Set the Integer Value to 3 to enable support for TLS 1.2. Your browser is now ready to support the TLS 1.2 protocol. IE8 Windows XP Your web browser is not supported by TLS 1.2 and must be updated. IE8 Windows Server 2003 Your web browser is not supported by TLS 1.2 and must be updated. IE8 Windows Vista Your web browser is not supported by TLS 1.2 and must be updated. IE8 Windows 7 You must enable support for TLS 1.2 in your browser. IE8 Windows Server 2008 Your web browser is not supported by TLS 1.2 and must be updated. IE8 Windows Server 2008 R2 You must enable support for TLS 1.2 in your browser. IE9 Windows Vista Your web browser is not supported by TLS 1.2 and must be updated. IE9 Windows 7 You must enable support for TLS 1.2 in your browser. IE9 Windows Server 2008 Your web browser is not supported by TLS 1.2 and must be updated. IE9 Windows Server 2008 R2 You must enable support for TLS 1.2 in your browser. IE10 Windows 7 You must enable support for TLS 1.2 in your browser. IE10 Windows 8 You must enable support for TLS 1.2 in your browser. IE10 Windows Server 2008 R2 You must enable support for TLS 1.2 in your browser. 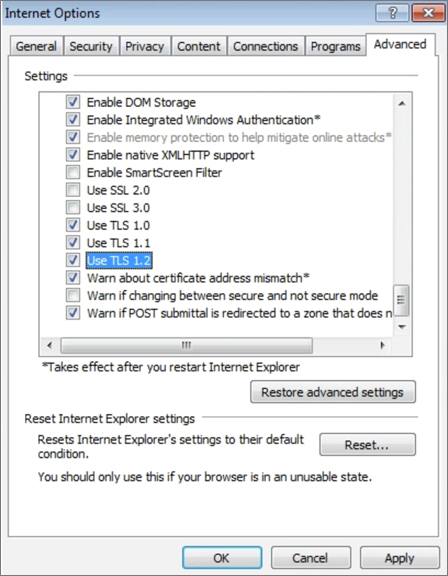 IE10 Windows Server 2012 You must enable support for TLS 1.2 in your browser. IE11 Windows 7 Your browser supports TLS 1.2. IE11 Windows Server 2008 R2 Your browser supports TLS 1.2. IE11 Windows 8.1 Your browser supports TLS 1.2. IE11 Windows Server 2012 R2 Your browser supports TLS 1.2. Check the boxes next to TLS 1.1 and TLS 1.2 to enable support for these protocols. - Window Phone 7.8 Your web browser is not supported by TLS 1.2 and must be updated. v10 Windows Phone 8 You must enable support for TLS 1.2 in your browser. v11 Windows Phone 8.1 Your browser supports TLS 1.2.
v12 Windows 10 v1507 Your browser supports TLS 1.2.
v13 Windows 10 v1511 Your browser supports TLS 1.2.
v14 Windows 10 v1607 Your browser supports TLS 1.2.
v15 Windows 10 v1703 Your browser supports TLS 1.2.
v16 Windows 10 v1709 Your browser supports TLS 1.2. - Android 4.0 and up Your web browser is not supported by TLS 1.2 and must be updated. - Android 4.0 and up You must enable support for TLS 1.2 in your browser. - Android 4.0 and up Your browser supports TLS 1.2. Scroll down to the Security section and check check the boxes next to Use TLS 1.1 and Use TLS 1.2. Your web browser is not supported by TLS 1.2 and must be updated. - Windows XP Your web browser is not supported by TLS 1.2 and must be updated. v6 - MAC OS X 10.8 Your web browser is not supported by TLS 1.2 and must be updated. - iOS 1.0 and up Your browser supports TLS 1.2. Your browser supports TLS 1.2.
iOS 2 Your web browser is not supported by TLS 1.2 and must be updated. iOS 4 Your web browser is not supported by TLS 1.2 and must be updated. iOS 6 Your browser supports TLS 1.2.
v7 iOS 7 Your browser supports TLS 1.2.
v8 iOS 8 Your browser supports TLS 1.2.
v9 iOS 9 Your browser supports TLS 1.2.
v10 iOS 10 Your browser supports TLS 1.2.
v11 iOS 11 Your browser supports TLS 1.2. 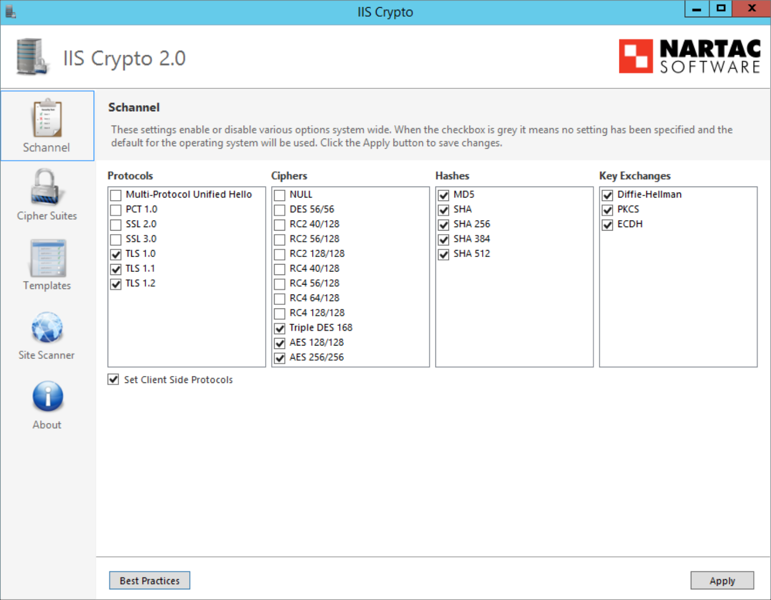 If you are using a version of Windows SChannel that is compatible with TLS 1.2 and are unsure how to configure your client-side settings to ensure TLS compliance, a 3rd-party tool exists that can be used to help you enable or disable various system-wide options. For more information, click here. CardConnect is not affiliated with this vendor. We are simply providing you with this information to further assist you in achieving TLS 1.2 compliance.